WHEN Ms Sylvia Tan's son entered primary school in 2010, she wanted to be there for him. Yet, she also hoped to stay in her role as vice-president for channel distributions at CTC Travel. A part-time arrangement made it possible. Ms Tan now works from 9am to 1pm, when her son is in school. She said with a laugh: "I actually work in accordance with the school term." Despite the common view that part-time work is only for those in service and administrative jobs, companies do offer part-time positions for professionals, managers and executives (PMEs), Senior Parliamentary Secretary for Manpower Hawazi Daipi said yesterday. 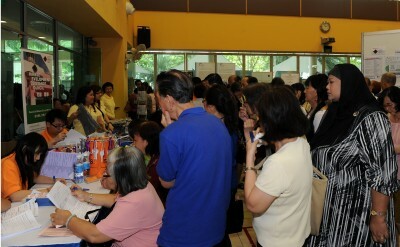 For instance, Khoo Teck Puat Hospital allows its doctors and nurses to work part-time. "This has helped them to attract and retain highly skilled talent, which is a key competitive advantage for them in the manpower-scarce health-care sector," said Mr Hawazi. Mr Hawazi, who chairs the tripartite committee on work-life strategy, was speaking at the Employer Alliance Annual Event, where CTC Travel and Khoo Teck Puat Hospital were among those lauded for work-life practices. While there are no figures on the number of PMEs enjoying part-time arrangements, three out of 10 firms offered part-time work options to employees in 2010. Part-time schemes, whether for PMEs or rank-and-file staff, bring other benefits, particularly in the ongoing labour crunch. Wildlife Reserves Singapore, which owns attractions such as the Singapore Zoo, has a pool of trained part-timers which it taps during peak seasons, helping it cope with fluctuating demand. Firms can also receive government help to set up work-life measures through schemes such as FlexiWorks! and the Work-Life Works! Fund. But mindsets must first change, and firms must be willing to come on board, said Mr Hawazi. Employer Alliance chair Claire Chiang said: "Part-time work can and should be treated as mainstream, and as professionally as full-time work."